The rapid growth in surveillance cameras is resulting in millions of face images and videos captured every day. The ability quickly and accurately to search all these images to assist in identifying criminal and terrorism suspects is an important and complex task that can contribute to making communities safer. To help in this effort, MSU has licensed its large-scale, automatic face-search system to NEC Corp. The rapid growth in surveillance cameras is resulting in millions of face images and videos captured every day. The ability quickly and accurately to search all these images to assist in identifying criminal and terrorism suspects is an important and complex task that can contribute to making communities safer. 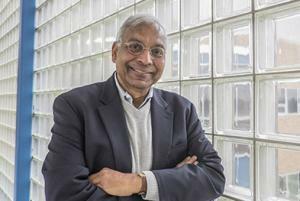 Michigan State University says it is supporting this effort by licensing its large-scale face-search system developed by biometrics expert Anil Jain, MSU Distinguished Professor of computer science and engineering; Dayong Wang, an MSU postdoctoral fellow; and Charles Otto, an MSU Ph.D. student. MSU’s automatic face-search system uses a photo from a surveillance camera or crime-scene image to quickly retrieve a list of potential suspects by searching a large database of face images and finding the closest match. “The strength of this face-search system is that it can process and search so-called ‘faces in the wild’ — unconstrained images,” Jain said. “Unconstrained images are those captured in everyday life that have varied poses, lighting and backgrounds that can make facial recognition challenging. When integrated with a commercial algorithm like NEC Neoface, we achieve even greater accuracy in matching unconstrained face images. To make the large-scale face-search system available for deployment, MSU has licensed it to NEC Corp. of America, one of the largest providers of biometric technology to law enforcement and commercial entities.